Address fields provides the necessary inputs for entering an address. This means you can add all the inputs for an address with a single click instead of adding, renaming, and formatting multiple fields. If you would like to remove the Country dropdown or only show US States, go into your Address field's options and scroll down to Address Type. There are three address types that can be used. International will include the Country dropdown. This will be selected by default. United States will not include the Country dropdown. The State field becomes a dropdown field with only US states. Other - exclude country field will not include the Country dropdown. If you would like to add placeholders to the address inputs, follow the steps below. Go into edit your form. Insert the desired placeholder text in your address fields. When the text is inserted, the default value icons will appear to the right of the text box. By default, the icon will appear. Click this icon to switch it to . Save the form and click Preview. 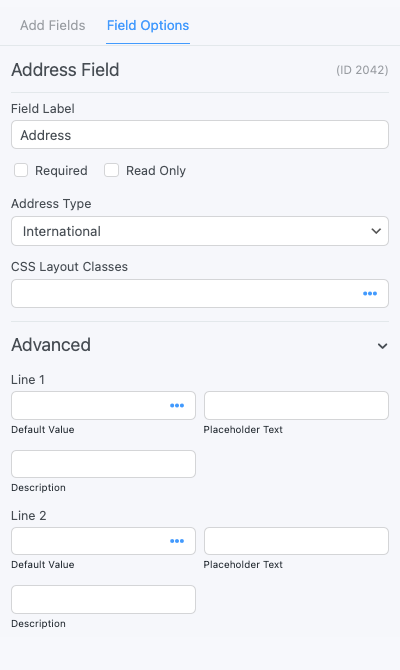 Now when the user opens the form, the address fields will show the placeholder text. When they start typing in the address fields, the placeholder text will be cleared. For more information on placeholder text and default values, visit the Default Values page. If you would like to display specific data from an Address field, insert the following shortcodes into a View or email. In all the examples, replace x with the field ID/key of the address field. Replace 'Ireland' and 'England' with the countries you would like to include. Change the labels in an address field with the frm_combo_dropdown_label hook.